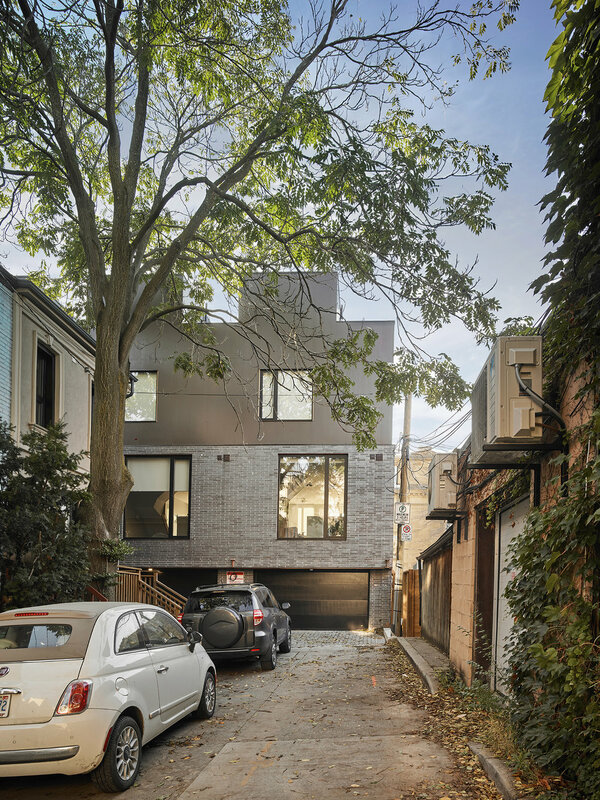 These live-work townhouses are located on a quiet street in Toronto’s rapidly densifying Riverdale neighbourhood. The project was separated into two phases. 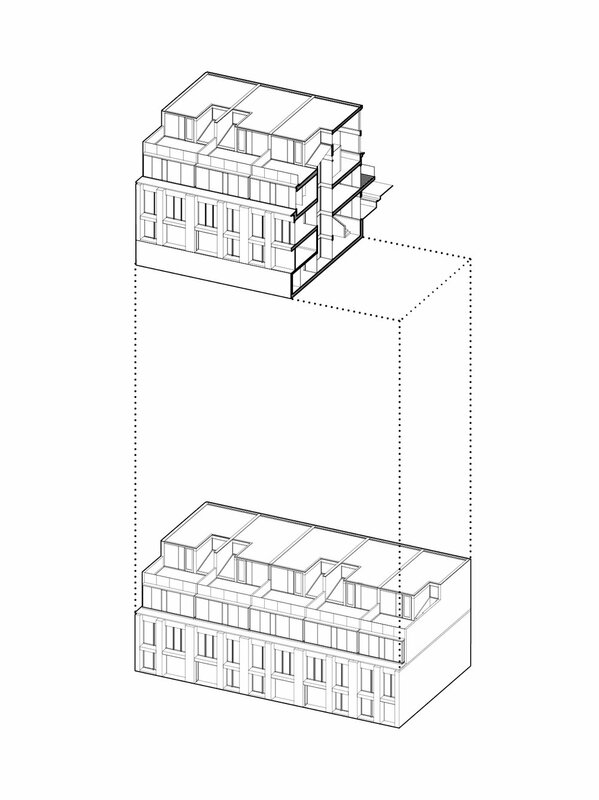 Phase 1, towards the South end of the block, consists of five deep units each with a mezzanine studio and an interior garden. Phase 2, towards the North end, consists of five shallower units and is serviced by a laneway at the rear. 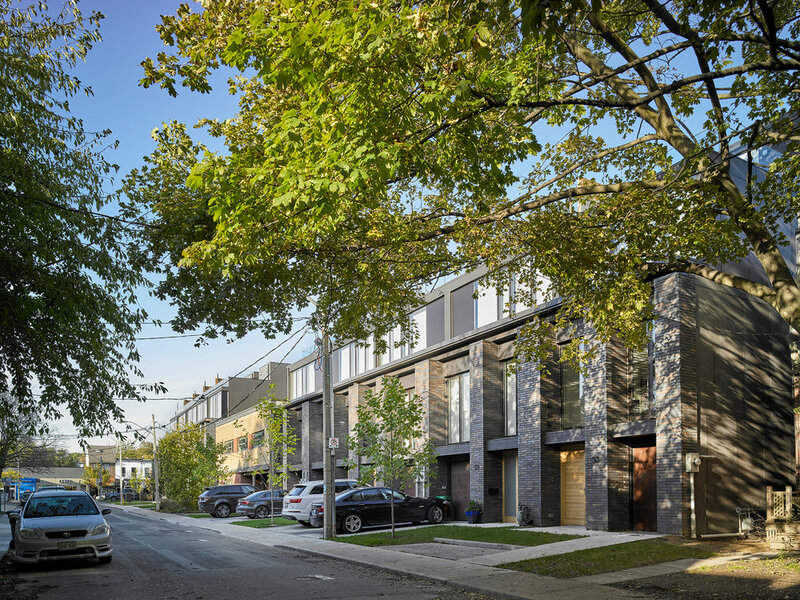 The townhouse blocks are developed on two existing, vacant, industrial properties separated by a residential building inbetween. One unique condition of Phase 1 is its landlocked nature; the site is bound by residential and industrial buildings on three sides. Phase 2 has a significantly different site condition: to the north, is an empty lot that has a seasonal garden centre; in the rear is a laneway that provides access out of the townhouses. While Phase 1 is hidden and nestled within its existing context, Phase 2 is more open and exposed to the street corner. Our design approach began with these differences in mind; the two developments share the same material palette but are still distinct. A deep rear setback is used to bring in light and air and to connect the indoors with the outdoor environment. The interiors are organized around two voids formed by a stairwell and a lightwell; these two voids divide each townhouse into two halves linked by a small bridge. The lightwells offset the building’s depth by allowing daylight to penetrate deep into each unit and provide the opportunity to grow private gardens and cultivate lush greenery. This arrangement generates a variety of distinct, naturally lit spaces which stand in contrast to the rigid, deep plans of conventional townhouses. The size and materiality of both developments respect the urban context while remaining modern in its expression. While the dark brick of the façade reflect contemporary aesthetics, it also speaks to the vernacular of its Victorian neighbours. The large roof terraces provided for each townhouse offer intimate views of the street below, and sweeping panoramas of the city beyond. The townhouse typology provides a means of urban densification without the environmental and infrastructural strains typically associated with larger developments. 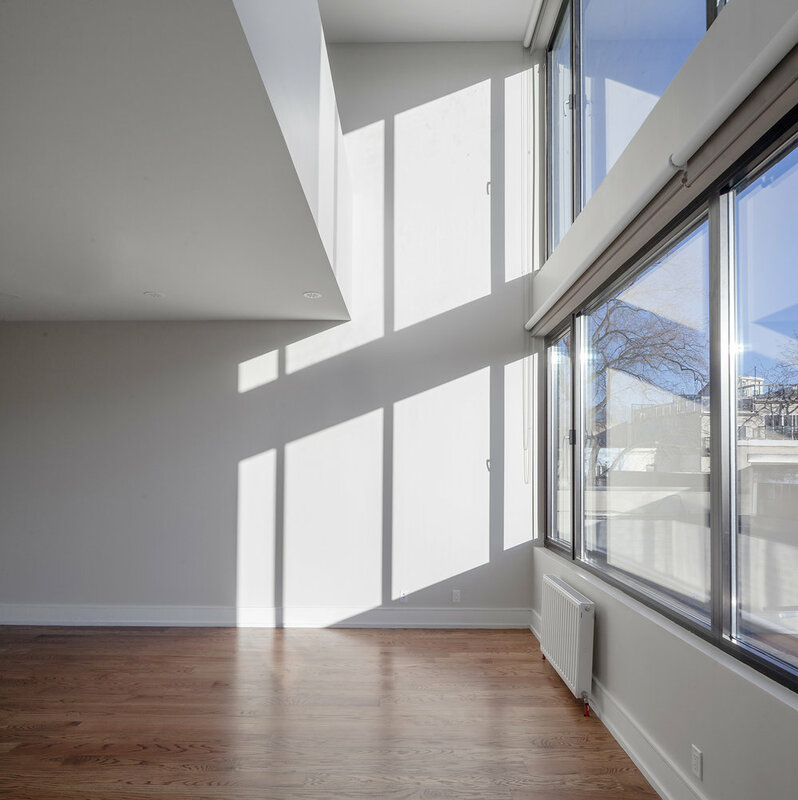 Additionally, large walls of high performance glazing with operable windows allow for ample daylight and natural cross ventilation, reducing overall energy consumption. The additional lighting and ventilation offered by the internal voids further decrease the need for extensive electrical or mechanical systems. Riverdale Townhomes acknowledge the economic realities of development without compromising spatial quality or architectural expression. They represent a sustainable model of incremental growth that is contextually appropriate, and considers both the city’s past and future.